Hoo-boy. Have I been busy (and it shows no signs of slowing down or stopping)! Our own Cookie's hilarious (and useful) , over on LuciteBox. Gwen has some here (which you'll need if you don't just follow my advice in this post). Robin sent me from eBay. Art lover? You want (or maybe don't want) to click. International Wear A Dress Day 2009 — Today! Today is International Wear A Dress Day (Observed) 2009! If you're wearing a dress today, feel free to upload a picture either to or as a Twitpic on Twitter with the hashtag #iwadd. If you're not wearing a dress today, that's your choice (and I fully support you in it), but I thought I'd post about some reasons I've heard people give for not wearing a dress on ANY day, and talk a bit about them. "I can't wear a dress to work, my co-workers will think I'm [too dressed up|snobby|looking for another job]." International Wear A Dress Day gives you the perfect excuse to wear a dress to work; you are celebrating the holiday! They wouldn't give you grief about a Christmas sweater, would they? (Okay, maybe they would …) The bigger answer to this is: what do you care more about? Their opinion? Or your happiness? "I can't wear a dress, [it's too cold/I ride a bike to work/I have to move boxes]." I have done all these things in a dress. (Today I will ride my bike five miles in a dress.) If there's a will, there's a way. These last two excuses are really a coded "Oh noes! What if people see my UNDERWEAR?" excuse, which I believe I answered with this rant right here. "I work in a male-dominated industry, and I don't want to look too feminine." Newsflash: I'm pretty sure they already know you're a girl. If you treat femininity as something to apologize for, so will they. Do they worry that they are "too masculine"? I'm betting not. Acting like a guy means doing whatever the hell you want whenever the hell you want until stopped by force (as far as I can tell). So if you want to seem less feminine to fit in, try that first. "I feel uncomfortable in dresses." That's not the question. (Actually, that's not a question at all.) The question is: do you *want* to feel comfortable in dresses? Then you have to start wearing them, or start trying things on until you find dresses you DO feel comfortable in. If you don't really care, then there's no problem; IWADD is a completely optional event. "I'm plus-size." Yes, finding attractive clothes that fit well when you're a plus size is not the easiest thing in the world. But if you are determined, it can be done, absolutely. I see plus-sized women in fantastic dresses every day, both in real life and on the internets. And there's always sewing for yourself, your sewing machine doesn't care what size you are, and it never gives you a snooty look when you walk into the sewing room. "I hate pantyhose." I hear ya, sister. I don't wear them either. I would say that unless you are a corporate lawyer or work in banking, bare legs or tights are acceptable in 90% of workplaces. "I work on an oil rig." Okay, yeah, maybe you should wait until your day off. Do you have other questions? Leave 'em in the comments, and I'll do my best to answer them! LOUISVILLE, KY— The nation's first academy for doughnut-shop hostesses has held its inaugural graduation ceremony last Saturday. The class, of ten aspiring fried-dough doyennes, graduated in an hour-long ceremony which featured a ten-minute silent intermission at the halfway point, "In homage to the hole," Academy Director Gilda Grant pointed out. "Doughnuts are important in our culture," Grant said in her commencement address. "They are eaten by bums and presidents, by children and the elderly, by the police and by criminals alike. Serving doughnuts is a sacred responsibility." Members of the first graduating class were equally solemn. "I am looking forward to the day when everyone knows the difference between a cruller and a buttermilk cake," said Sandy Muller, of Fells Point, Wisconsin. Employment prospects seem bright for these students; many have already received offers from doughnut shops in their hometowns. But with their new credentials, they can afford to be picky. "I got an offer from a place in High Point," said one student, who didn't want to be named. "But they spelled it D-O-N-U-T, so I turned them down." Grant expects that enrollment in the academy will continue to increase. "In hard times and in good, people want doughnuts. And doughnuts are tastier when served by a trained professional." 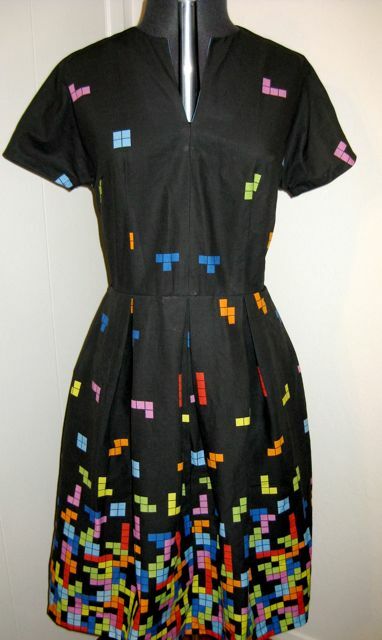 Well, it's been a , but I have FINALLY finished my Tetris dress, and here it is. If you like this dress, would you do me a favor and tweet/Facebook/delicious the link around? I'm having a personal-best contest to see if this one shows up in more places than the ! I've been remiss in setting a date, and the year's getting down to the thin end. How do people feel about Thursday, October 29? Thoughts? 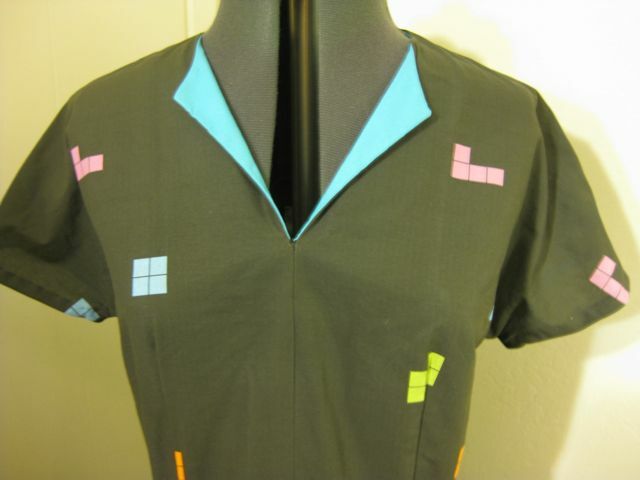 I would like to say I would be wearing this custom dress from Etsy seller , all the better to umpire International Wear A Dress Day, but sadly, I won't be. What else should we do to celebrate? Make buttons (or "badges" for you in the UK)? Sticker templates, like the ones you wear after you give blood? What should the Twitter hashtag be? #IWADD? (That looks … unfortunate, but hey, we didn't backronym it correctly, and now we're stuck with it.) Should we have a Flickr group? Hmm. 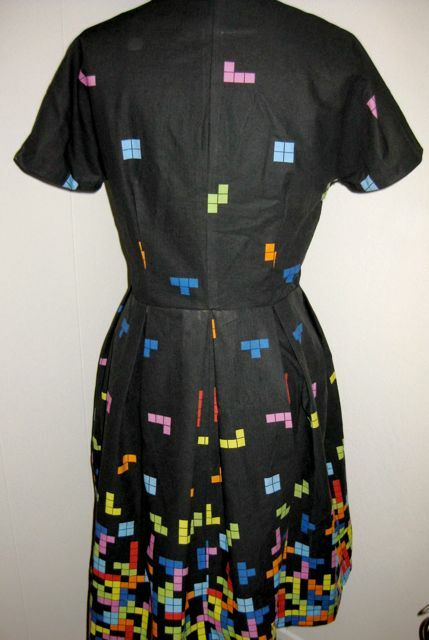 Anyway, if you buy this dress (click ), would you check and see if the hem is finished with bias tape and the notches are clipped in instead of out? That would help me figure out if Future Me ever made it back. Thanks! I am, for the first time that I can REMEMBER, not wearing ANYTHING that I made today. For reals, and srsly. I am not sure how this happened, but I blame this skirt above. I was so excited to see a that I hit "Buy" before I realized that, since I only make dresses and skirts, BUYING a skirt would mean that I would be venturing out of the house in clothing made entirely by OTHER PEOPLE. Which I did today, and yet the sky didn't fall. I do think it's slightly boring, as clothes go. It could be because I'm wearing (with the black skirt) a dark gray t-shirt, heather gray cardigan (with pockets! ), knee-high socks with an abstract black-and-gray argyle pattern, and black penny loafers. This is my own fault; I could have worn a bright yellow cardigan and pink t-shirt, with yellow-and.jpgnk socks (this is not a thought experiment; I have such items in my closet). The nice thing is that I am wearing a very pretty gray pearl-and-chain necklace that my mother gave me years ago and that I hardly ever wear (because when you're leaving the house in stripes/camo/huge florals/very bright geometric patterns jewelry seems a little beside the point). Weirdly, though, even though I'm wearing all gray and black, I feel tremendously conspicuous. If you're wearing a bright-orange dress printed with anvils (just as a thought experiment; I don't actually have a bright-orange dress printed with anvils … yet) you obviously don't give a damn about what people think about your clothes, so any judgments roll right off you. If you're wearing a tasteful black skirt, gray cashmere cardigan, and pearls, well … see what I mean? There will be twenty other women on the street wearing the same thing today, and I am definitely NOT in the top ten percent of women who can do this look right. It seems odd to feel more conspicuous in a tasteful knit skirt than in orange-and-anvils, but obviously orange-and-anvils is my comfort zone, and that's all there is to it. To sum up: it's a nice skirt. I like it. Next time I'll wear it with bright colors. Also, I need an orange dress printed with anvils.